We are thrilled Spring is finally upon us, and that we can start thinking about warmer weather, grilling and all the tasty produce that is coming into season. 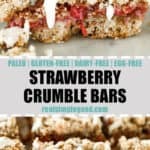 These strawberry crumble bars are the perfect Spring treat that’s Paleo, Dairy-Free, Refined Sugar-Free and even Egg-Free too! 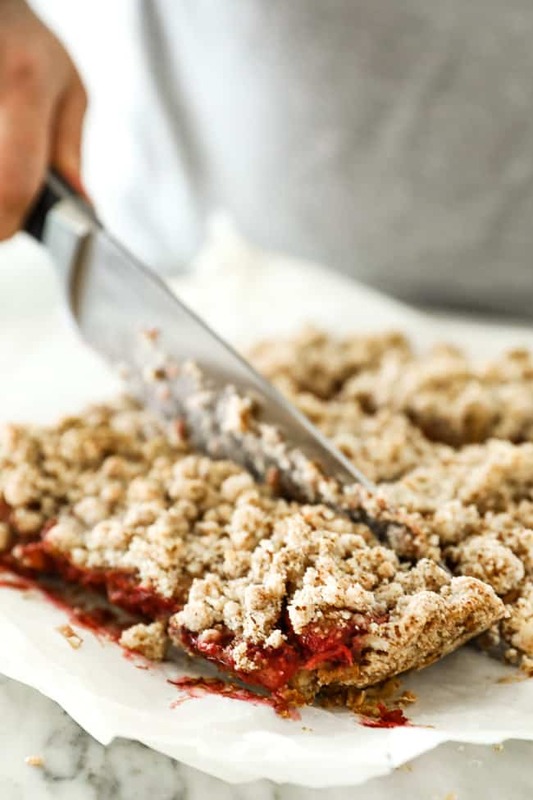 What I love about this recipe is that the crumble and the crust are the same thing! You make one big batch, and then use 2/3 for the crust and the remaining 1/3 for the crumble on top. 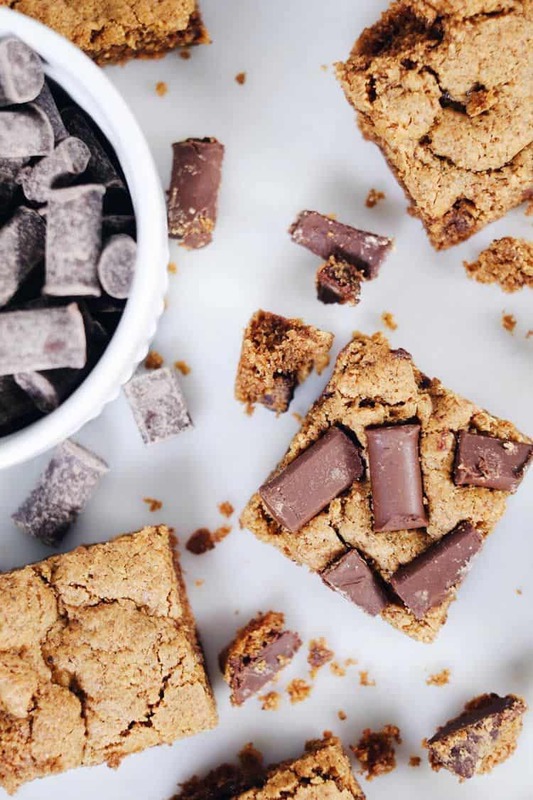 It’s super easy to make and tastes delicious. 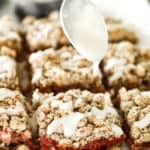 These strawberry crumble bars will be a hit wherever you take them! We used a combination of Bob’s Red Mill Almond and Tapioca flours for the perfect mix of gluten-free flours. We also used their coconut sugar for both the crust and the filling. Bob’s Red Mill is our go-to for gluten-free and grain-free flours! We’ve used them for years and always count on their quality products as a pantry staple in our house. High quality and minimally-processed products from the mill to our table is just how Bob’s Red Mill does business. We think it’s pretty cool that even though they have grown to be a larger company, they keep their family feel and are still employee-owned. Also, did you know Bob’s Red Mill headquarters are in Portland, OR? We love supporting our local partners! You can buy coconut butter at health food stores or online, but it’s kind of spendy. 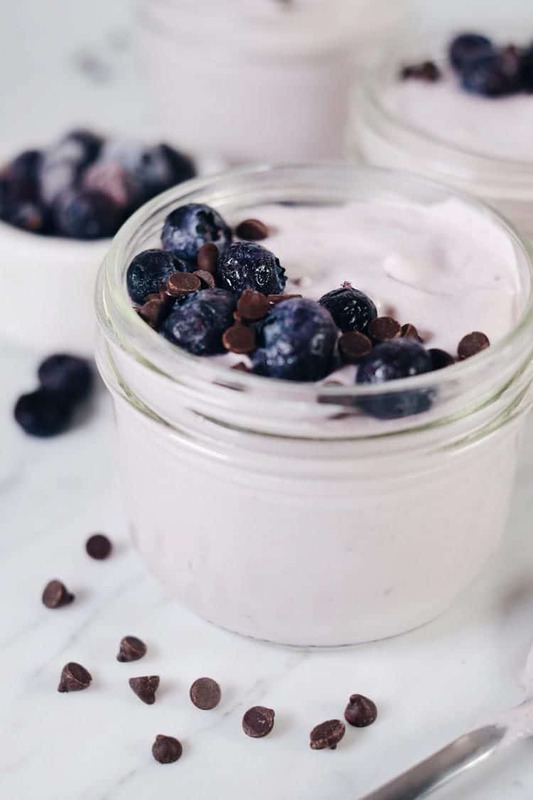 So…I like to point out that it is SUPER easy to make at home and will save you a bunch of money…You just need some shredded coconut and a food processor. Add the shredded coconut to your food processor and process until it turns creamy and buttery in texture. Stop and scrape down the sides as needed. 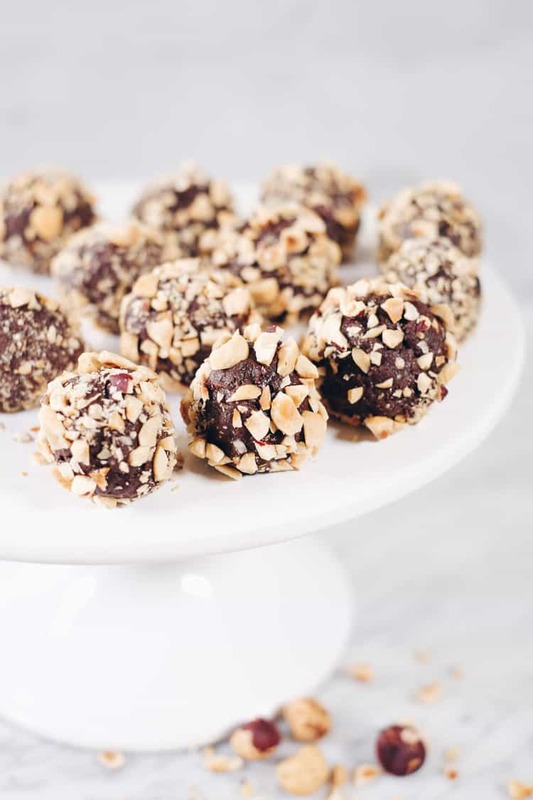 It feels like you aren’t getting to the buttery texture, add about a tablespoon of coconut oil and keep on keeping on. It takes around 5 minutes to get to the creamy texture. 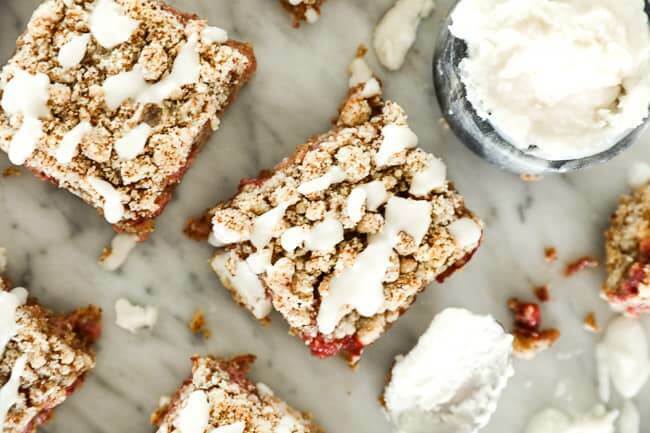 Whether you’re looking for a baking project for the upcoming weekend or planning for Easter, make these Strawberry Crumble Bars! Leave a comment below and let us know how it goes. Also, take a pic to share on Instagram. Tag us @reasimplegood, so we can see and maybe share in our Stories. Give us a follow if you don’t already! We’d love to stay connected! 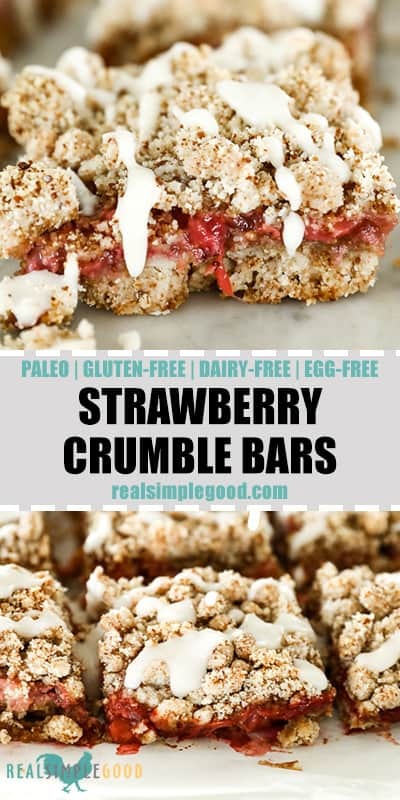 These Strawberry Crumble Bars are the perfect Spring treat that’s Paleo, Dairy-Free, Refined Sugar-Free and even Egg-Free! 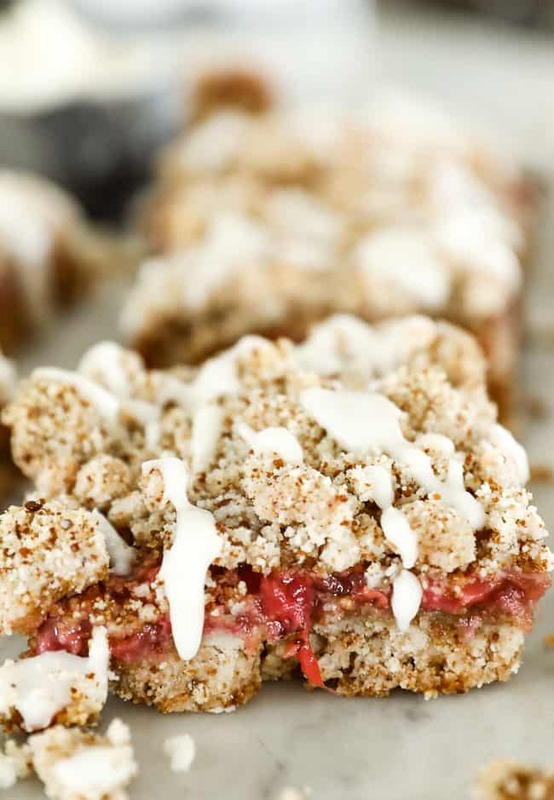 They’ll be one of your new favorite healthy strawberry recipes. Place coconut butter jar in a bowl of hot water to soften it. Then, get your strawberry filling going. Place strawberries, water and coconut sugar (if using) in a sauce pan over medium-low heat. Let them start to break down, stirring occasionally. 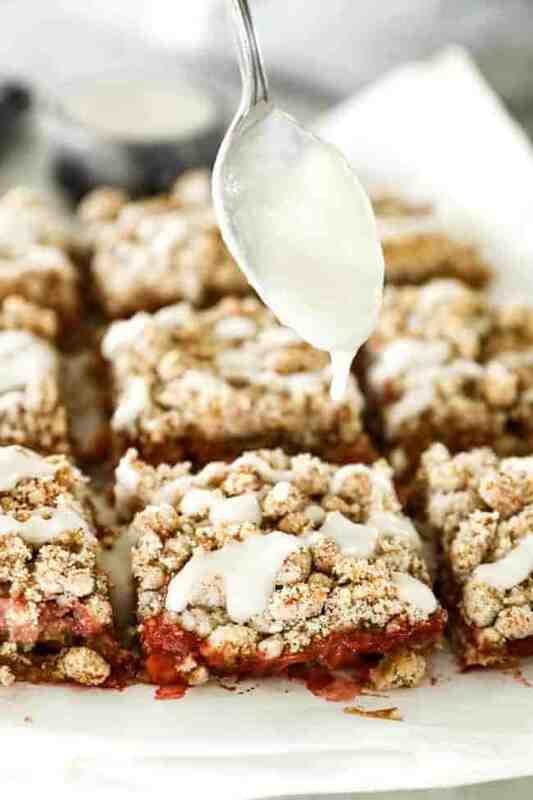 While the strawberries are on the stove, make crumble/crust. Place all of the crumble/crust ingredients, except for the coconut butter and oil, in a large mixing bowl. Use a fork to mix the ingredients up a bit. Add coconut butter and oil. Use fork to mix ingredients, until little crumbles form. You don’t want to over mix. 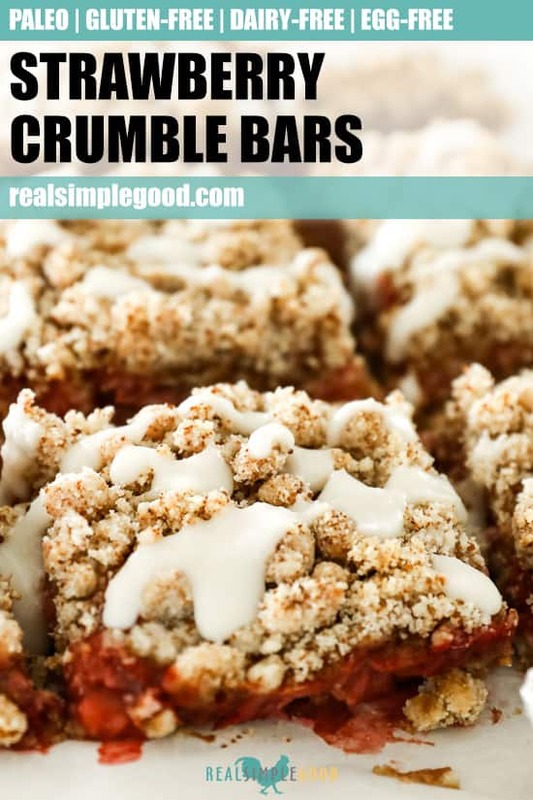 Keep the crumbles alive. 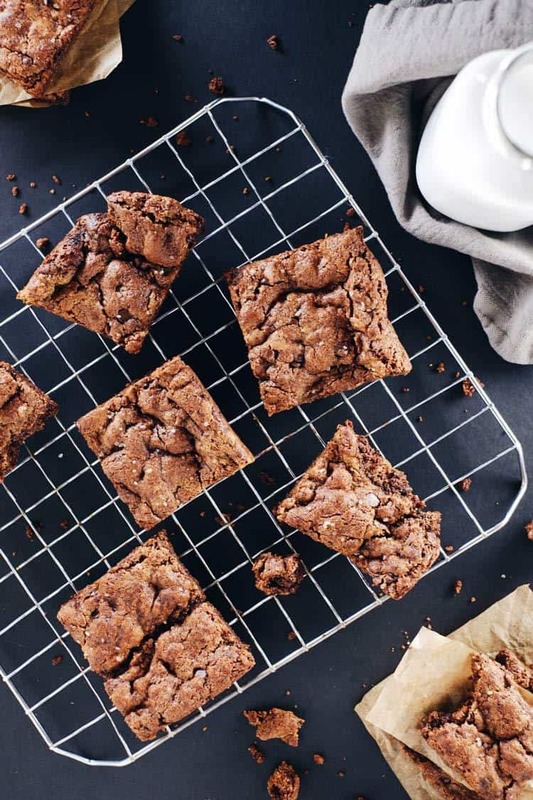 Preheat oven to 350° F, and line a square pan with parchment paper. Place about 2/3 of the crumble/crust mixture in the pan. Press it down to make the crust layer. Go back to your strawberries. They should be broken down and saucy. Turn heat off and stir in balsamic vinegar. Layer strawberry mixture on top of crust. Sprinkle the remaining crumble mixture on top. Place in the oven and bake for about 30 minutes. Remove from oven and let cool completely. 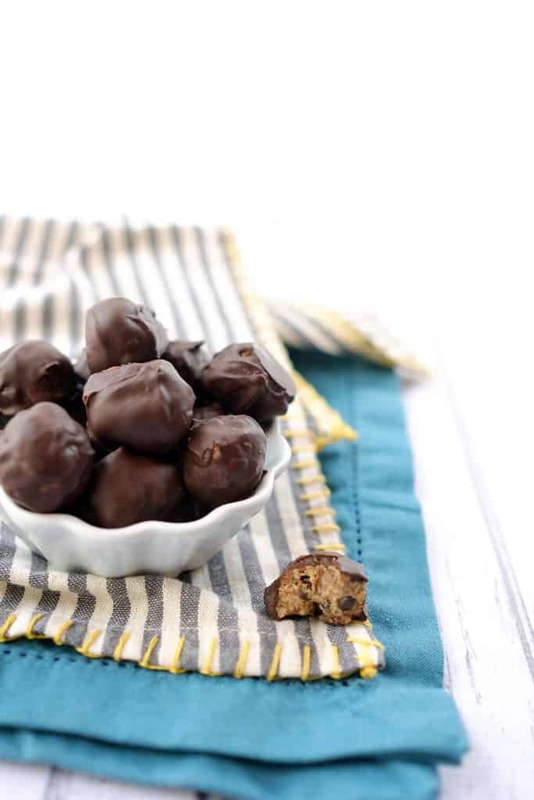 You can even let them set in the fridge for about 30 minutes. Slice and serve. 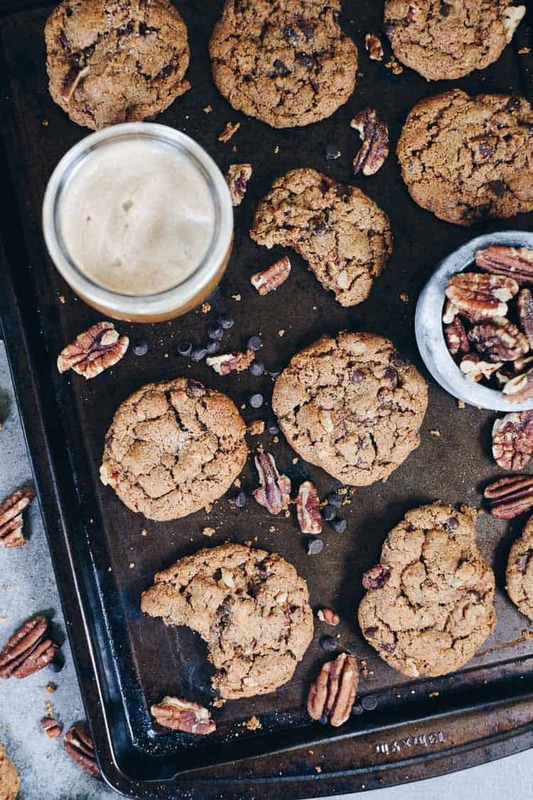 They go great with a little coconut cream whipped cream or vanilla ice cream! Enjoy!